The Itsy Bitsy Spider Crochet: Just published my new Shrimp Delight pattern! Just published my new Shrimp Delight pattern! 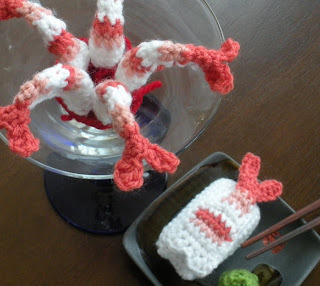 I just finished publishing my new Shrimp Delight pattern on Ravelry this morning. It all started out when I wanted to make some ebi (shrimp) nigiri to go with the sushi sets I've been selling on Etsy. But, as I was working on the shrimp for my rolls, I got this crazy taste for the spicy-tangy-sweet-salty taste of shrimp cocktail. Next thing you know, there are half a dozen shrimp placed neatly in a martini glass with a little yarn "cocktail sauce." Needless to say, the visual DID NOT help with my craving, but maybe now that I'm done with another round of neurotic, obsessive-compulsive pattern writing, my husband and I will be able to score a little babysitting time so that I can indulge. While I worked on the cocktail shrimp, I also found out that these little buggers also make fun cat toys. In fact, even my fat, lazy 13-year-old cat couldn't resist batting one around! The pattern is available from Ravelry for a limited time, introductory price of only 75 cents. Enjoy!